Winter days beg for hearty breakfasts and brunches, and this tasty bacon recipe is sure-to-please. Put strips of bacon on a baking sheet. Strip leaves from one sprig of rosemary per half pound of bacon and sprinkle them over the meat. Add fresh-cracked pepper to taste and roast at 400°F until crisp, about 10 minutes. 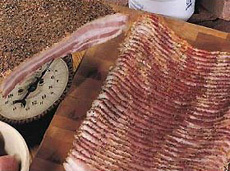 Or, you can start with Nueske’s delicious pepper bacon. Either will make your eggs or BLT sing an exciting new tune.- Read about more of our favorite pork products in THE NIBBLE online magazine. You’ll love your homemade pepper bacon, but treat yourself to some from a top producer, too. You can celebrate with New England Clam Chowder (sometimes called Boston Clam Chowder), Manhattan Clam Chowder or even Rhode Island Clam Chowder; restaurants tend to serve one or the other. 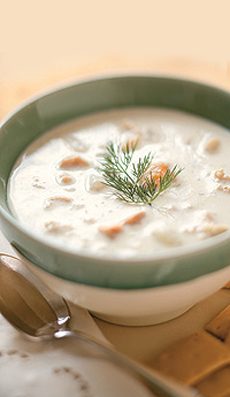 New England Clam Chowder is the oldest version. According to the book 50 Chowders by Jasper White, the oldest-known printed chowder recipe is for fish chowder, printed in the Boston Evening Post on September 23, 1751. It calls for onions, pork, salt, pepper, parsley, sweet marjoram, savory, thyme and a biscuit (later replaced by oyster crackers or saltines served with the soup instead of cooked into it)—ingredients that are still used today. New England Clam Chowder. If you like creamy soups, the New England style may be more of your cup of soup. It’s milk- or cream-based (with flour as a thickener), and splattering it is unlikely to permanently ruin that shirt or tie. Manhattan Clam Chowder. If you want to save calories or cut back on cholesterol, Manhattan Clam Chowder is based on broth and tomatoes. It is actually an Italian clam soup, arriving on these shores with Italian immigrants in the late 1800s. It tends to be seasoned with oregano, from its Italian heritage. The original Italian soup achieved broader appeal with the name of New York Clam Chowder, which evolved to Manhattan Clam Chowder. Rhode Island Clam Chowder. This variation, found chiefly in Rhode Island, is made with clear broth. All chowders tend to be made with potatoes, onions, and of course, clams. If you have a shellfish allergy, you can opt for Fish Chowder, which substitutes shredded fish, often cod, for the clams, and throws in corn kernels for good measure. The word chowder has its roots in the Latin word calderia, which originally meant a hearth for warming things and later came to mean a cooking pot. The word evolved to cauldron, which in French became chaudiere, a heartbeat from chowder. The first chowders in our culture were fish chowders, made in cauldrons in fishing villages along the coast of France and in the Cornwall region of Southwestern England. When the fishermen came to the New World, they found clams in huge supply along the northern Atlantic coast, and clam chowder was born. Here’s a review of one of our favorite New England Clam Chowders, available by the can from Bar Harbor Foods. How Many Types Of Soup Have You Had? Check out our delicious Soup Glossary. If you can’t find the flavored water you want in a store—or if you want to save the amount of plastic you consume—you can make it yourself and save both money and the environment. Refill a 16-ounce water bottle with water and start by adding 5 drops of flavor extract (from the spice department) with a clean medicine dropper. We love making mint water this way! If you want to sweeten your water, add a few drops of low-glycemic agave syrup (you’ll find it in the supplements department of natural food stores), or use a liquid non-caloric sweetener. Read about the water that inspired us to make our own, Hint Water, a NIBBLE Top Pick Of The Week. Find more of our favorite waters in the Bottled Water Section of THE NIBBLE online magazine. 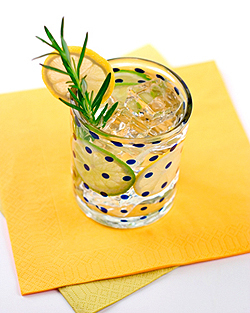 We made mint water with mint extract, and added a spring of fresh rosemary and a lemon wheel to layer the flavor. Great taste, zero calories. Looks pretty…but don’t take a bite, even though the serrano chile is just “medium heat.” Serranos are used in milder hot sauces. How hot is hot? You’ll find out if you’re the winner in THE NIBBLE’s Gourmet Giveaway this week. Just answer a few trivia questions about hot sauce—you don’t even have to answer them correctly. Everyone who enters has an equal chance of winning. The prize: A hot sauce sampler from award-winning Dave’s Gourmet, providing you with a variety of flavors and heat levels. You’ll get bottles of Original Dave’s Insanity Sauce, Dave’s Hurtin’ Habañero, Dave’s Ultimate Insanity, Dave’s Cool Cayenne and Dave’s Crazy Caribbean. All are made with the best natural ingredients. 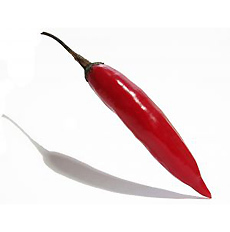 Learn more about the different types of chiles and heat levels in the Chile Glossary in THE NIBBLE online magazine. NOTE: Even after the Gourmet Giveaway is over, you can still take the quiz and learn more about hot sauce. After all, learning is its own reward. We’ve tasted hundreds of olive oils, and know that among the basic styles—mild, buttery, herbal, fruity, peppery, earthy—we like herbal and fruity flavors, but tend to avoid those cough-inducing peppery styles. Others may go straight for the pepper. But when you’re staring down a shelf of two dozen or more olive oils, you haven’t a clue as to which tastes like what. And you probably don’t have THE NIBBLE’s review of 90+ extra virgin olive oils with you. So, plunk down $15 or so, and hope for the best. But if you live in St. Louis, or other towns where olive oil tasting bars are popping up, you actually can try before you buy. Extra Virgin, an olive oil boutique that opened in October 2007, stocks 25 to 30 oils from Spain, Italy, France, Greece, Chile, Australia and the United States. 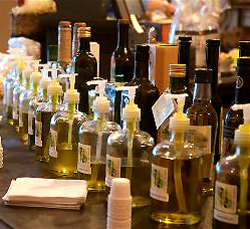 Now, you can try before you buy, and select the olive oil that pleases your particular palate. – See the different flavors of olive oil on TheNibble.com. – See how the flavors and aromas come together with this olive oil wheel. – Clarify specific terms in our olive oil glossary. – Read about our favorite olive oils in the Oil & Vinegar Section of THE NIBBLE online magazine. – Check out our mega-review of 90 extra virgin olive oils.